Doolittle Tokyo Raiders Congressional Gold Medal in presentation case. Photo courtesy of House Speaker Boehner’s office. WASHINGTON – Members of the Doolittle Tokyo Raiders were awarded the Congressional Gold Medal collectively during a ceremony on April 15 in Emancipation Hall in the U.S. Capitol Visitor Center. The medal was awarded to the volunteers of the 17th Bombardment Group, led by Lt. Col. James Doolittle during World War II, who made the first strike against Japan on April 18, 1942. The top-secret mission called for the raiders to take off from an aircraft carrier approximately 450 miles outside of Japan, bomb select Japanese targets, and then fly to safety in unoccupied areas of China. The operation was risky, as medium bombers had never before flown from a carrier, and sailing so far into enemy territory was dangerous. Taking off from the deck of the USS Hornet (CV-8) in 16 B-25s, the five-member crews successfully completed the first leg of their mission, bombing oil storage facilities, factory areas, and military installations. Dwindling fuel supplies, however, prevented the crews from reaching the designated friendly airfields, forcing them to ditch their aircrafts at sea, bail out, or crash-land in China. One crew flew to the Soviet Union, where its members were held as prisoners until they escaped 13 months later. Thanks to the heroic efforts of the Chinese, most of the Doolittle Raiders evaded capture. 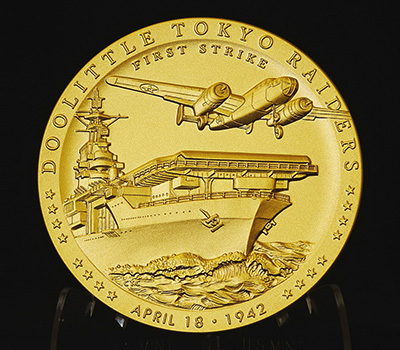 The medal’s obverse design features the North American B-25B Mitchell launching off the USS Hornet (CV-8), 16 stars representing the 16 flight crews that made up the Doolittle Tokyo Raiders, and the inscriptions “DOOLITTLE TOKYO RAIDERS,” “FIRST STRIKE,” and “APRIL 18, 1942.” United States Mint Artistic Infusion Program (AIP) artist Chris Costello designed the obverse, and United States Mint Sculptor-Engraver Don Everhart sculpted the design. The reverse design features B-25B Mitchell aircraft approaching their target with four patches representing the four squadrons (34th, 37th, 89th, and 95th) that make up the 17th Bombardment Group. 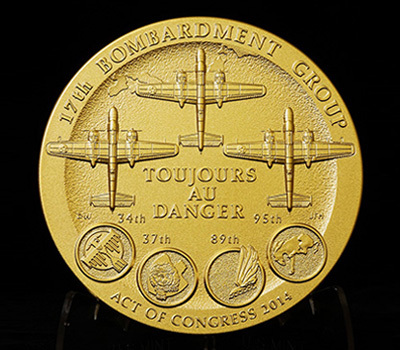 The inscriptions are “17TH BOMBARDMENT GROUP,” “TOUJOURS AU DANGER” (French for “Still in Danger”), and “ACT OF CONGRESS 2014.” AIP artist Donna Weaver designed the obverse, and United States Mint Sculptor-Engraver Joseph Menna sculpted the design. Public Law 113-106, which requires the United States Mint to strike the Congressional Gold Medal for the Doolittle Tokyo Raiders, also authorizes the bureau to strike and sell bronze reproductions of the medal. The three-inch medal (product code 15MA) will be priced at $39.95 and the 1.5-inch medal (product code 15MB) will be priced at $6.95. Orders will be accepted starting April 16, 2015, at noon Eastern Daylight Time via the bureau’s online catalog and at 1-800-USA-MINT (872-6468). Hearing– and speech-impaired customers with TTY equipment may call 1-888-321-MINT (6468).